No electricity of any kind is necessary. Just gently push open the gate with your truck, ATV, tractor, or any vehicle with a bumper, and it will lock securely behind you. All of the parts are shipped to your home with complete instructions and a step-by-step instructional DVD. Anyone can install it in just one day, without professional help. Never deal with snow, rain, ice, or mud, ever again. Never leave your ride just bump n' drive. A bump gate is the most economical solution to navigating on and off your property with ease. No electricity is required. No need for professional installation. One year warranty for all parts included. "When I ordered my Bump N' Drive, I thought I'd need lot of help putting it in service as my left arm and hand is very deformed from birth some 70 years ago, but I finished and it works very well, it took me a lot longer then most, but I did it myself, so if I can do it anyone can. Its open range here and I put it in to keep other cows out." - Thanks, Bob H.
"After receiving the kit and DVD I installed my gate (put down posts and attached metal fittings, etc.) in only a few hours. Everything seemed to work perfectly. In a few days I will be 77 and am beginning to have mental issues. When this happens, "I try again tomorrow." My son, who is "mechanically minded," finished the bump mechanism assembly and now the gate works great. Thanks for your help, and for producing this wonderful Bump N' Drive, which already saves me much time and effort. If I can ever help or recommend anything to others, please let me know." - Sincerely, John D.
"We were very happy to receive our Bump N' Drive. It's the perfect solution for us. Thank you, we love the Bump N' Drive." - Deb C.
Bump N' Drive supplies innovative upgrade kits to convert farm, ranch, or cattle tube gates into an automatic gate opener. Designed and engineered in the United States, the mechanism holds the gate open as you drive through it, which is a patented feature. The owner, Bill Peters, uses this system on his Missouri cattle farm on both the farm entrance gate, as well as the gates between fields where he checks cattle using his F-150 or his Ford Explorer. The design of the Bump N' Drive gate opener kit was inspired by farmers working on a 2-million-acre ranch that didn't have too many fences. When the driver came across an exit gate, he would push the gate open with the bumper of his jeep or truck. An old tire was usually strapped to each side to prevent damaging the gate or vehicle. Today, our gate opener kits allow farmers around the world to enter & exit their property, by pure mechanical and gravitational means. Our functional and economical bump gate allows ranchers, farmers, and small property owners to experience the freedom and flexibility of navigating on and off the property with ease. Our Mission: Customer satisfaction is our goal. Improve the functionality of your gate by installing our inventive gate opener kit. All of the parts are shipped to your home with complete instructions and a step-by-step instructional DVD. Bump N' Drive works for various types of vehicles, including RVs, semitrucks, farm vehicles, and pickups with trailers. It's also used on golf courses.
" I thought I'd need lot of help putting it in service as my left arm and hand is very deformed from birth some 70 years ago, but I finished and it works very well." Our kits are engineered to fit any farm or ranch pipe rail gate, as well as many other types. You can install everything in 5 easy steps. No electricity of any kind is necessary. Just gently push open the gate with your truck, ATV, tractor, or any vehicle with a bumper, and it will lock securely behind you. Never deal with snow, rain, ice, or mud, ever again! PAYMENTS ACCEPTED OVER THE PHONE! Turn your existing gate into a drive-through gate without replacing it. 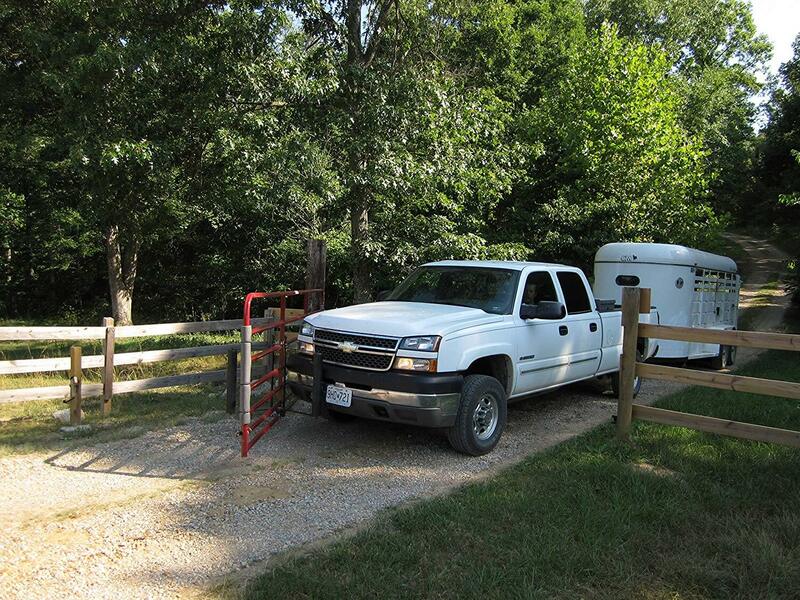 We've created a functional and economical bump gate for ranchers, farmers, and property owners. Easy set up. Professional installation isn't necessary. Takes a few hours, and you're all set. Our gate opener can open and close gates by pure mechanical and gravitational means.